SANA hosts two Trade Fairs each year based in Knoppieslaagte (Midrand) and Durban respectively. 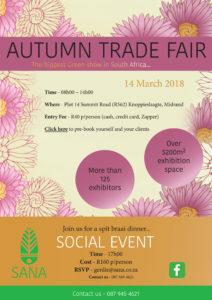 Growers and Allied Trade suppliers use this wonderful opportunity to exhibit their products and services. 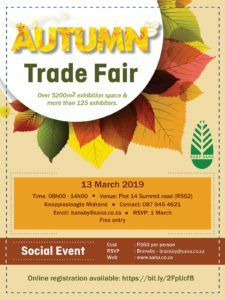 These shows are growing in size and popularity and our Gauteng Trade Fairs are the biggest green industry fair in South Africa with more than 125 exhibitors and over 1000 visitors.